While reading “My Father’s Stack of Books” by Kathryn Schulz in The New Yorker, I came across her description of her father as an “epic raconteur.” I stopped. Word bliss settled in. “Raconteur.” I hadn’t thought of that word for a while. Don’t you love it when you encounter an old friend? A word that you admire for its meaning and its sound and the feelings it stirs inside you? 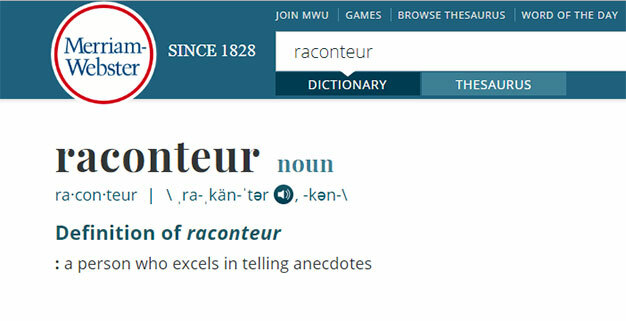 Merriam Webster says this about the etymology of “raconteur”: The story of raconteur is a tale of telling and counting. English speakers borrowed the word from French, where it traces back to the Old French verb raconter, meaning “to tell.” Raconter in turn was formed from another Old French verb, aconter or acompter, meaning “to tell” or “to count,” which is ultimately from Latin computare, meaning “to count.” Computare is also the source of our words count and account. Raconteur has been part of the English vocabulary since at least 1828. I will express my gratitude for the meaning of words, the sound of words, and the origins or words more than once during this Year of Gratitude. They are one of the greatest pleasures of my life. Do you have a word you’ve re-discovered recently? I love putting on my Word Detective hat. I recently read a novel set in 1920s Minneapolis and Hollywood, The Looking Glass Goddess, by Amanda Hughes. The author was good about including authentic locations, food, styles, and phrases. One of those phrases, “Tell it to Sweeney,” I had never heard before. Was this a real thing? What did it mean? The hunt was on. First, I looked it up online. According to Wikipedia, a silent movie was released in 1927. But there’s no notation about the plot. On a site named Tell It to Sweeney: the straight dope about the 20s, 30s, and 40s, I found the explanation that the original phrase was “Tell it to the Marines,” first used in 1804 in The Post Captain: Comprehending a View of Society and Manners “in which author John Davis proclaims, ‘You may tell that to the Marines but I’ll be damned if the sailors will believe it.’ The variation that uses the name “Sweeney” referenced the myriad of monikers used to describe the stereotypical Irishman.” Aha, so now there is a derogatory connotation to the phrase. Time to head to my print reference collection. In Brewer’s Dictionary of Phrase & Fable, I find no reference to ‘tell it to Sweeney,” but “tell that to the Marines” has an entry. “Said of a farfetched yarn. The story is that Pepys, when re-telling stories gathered from The Navy to Charles II, mentioned flying fish. The courtiers were skeptical, but an officer of the Maritime Regiment of Foot said that he too had seen such. The king accepted this evidence and said, “From the very nature of their calling no class of our subjects can have so wide a knowledge of seas and lands as the officers and men of Our Loyal Maritime Regiment. Henceforward ere ever we cast doubts upon a tale that lacks likelihood we will first ‘tell it to the Marines.’” Brewer’s was first published in 1894 in England. “Tell it to Sweeney! (The Stuyvesants will understand. )” was an advertisement for the New York (NY) Daily News, first appearing in August 1922. The Daily News positioned itself as the newspaper of the average working man—such as the Irish “Sweeney.” The name “Stuyvesant” was used to represent blue bloods. If you advertise in the Daily News and reach the Sweeneys of New York City, the Stuyvesants will also get the message. ‘Tell it to Sweeney!” had been in slang use since 1910. “If you have any harness trouble tell it to SWEENEY, the leading harness maker,” appeared as an ad in 1909, but it’s not certain if this is connected to the slang use. 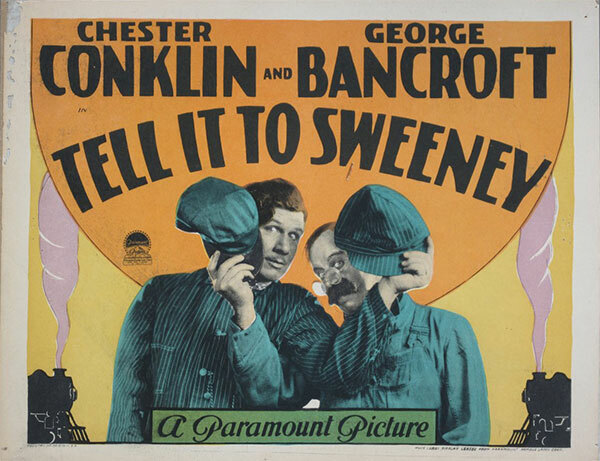 The song “Tell it to Sweeney,” with words by Will Dillon and music by Harry Von Tilzer, appeared in The Yankee Girl that opened in the Herald Square Theatre on February 10, 1910, and ran for 92 performances. The slang use is probably related to this song, with “Sweeney” being a typical Irish name for a policeman. This is satisfying. I can get lost for hours pursuing word and phrase origins. I am grateful to the people who record these origins for posterity. I’m curious. Had you heard the phrase “Tell it to Sweeney” before?